I was carrying on last week about the descriptive Modernist works that caught my ear in the first important leg of my listening life. To that list I most certainly could add the two works contained on a new live performance release as played by Miguel Harth-Bedoya and the Fort Worth Symphony Orchestra. 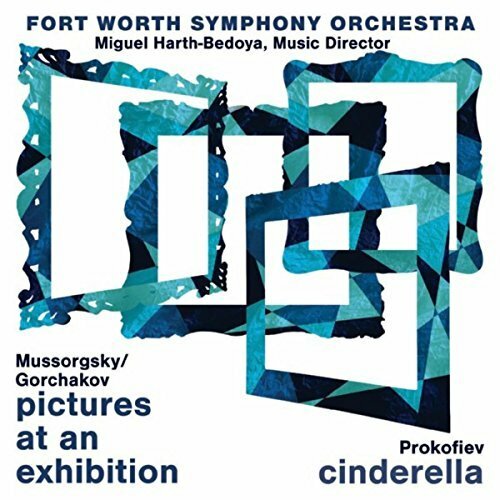 Namely Mussorgsky's Pictures at an Exhibition (here in the somewhat rarely performed 1955 orchestration by Sergei Gorchakov) and Prokofiev's Cinderella (FWSO ((Live))), the latter for this recording-performance in a selection of 13 movements from the original ballet score. To call Mussorgsky a Modernist is of course not strictly factual. After all he wrote "Pictures" in 1874 and was not at all a typical practitioner of such things as modernity. By other measures he was enormously influential as a lineal forebear to later Russian modernist masters like Stravinsky and Prokofiev. So the juxtaposition of Mussorgsky's "Pictures" and Prokofiev's "Cinderella" seems very appropriate and stylistically nearly synonymous. So then to the Mussorgsky. The Ravel orchestration of "Pictures" that has come down to us is brilliant and seemingly has defined for good and all our idea of what the orchestral version should sound like. It of course bears the stamp of Ravel's impressionist palette, which gives certain movements great color. The Sergei Gorchakov has the disadvantage as coming along at a time (1955) when most no longer thought of other orchestrational possibilities. Nonetheless this alternate orchestration gives us a fresh look at what can be done. There is generally something rather more Russian to be heard here, less colorful but more dramatic. Perhaps it is more rough-hewn, heavier, closer to the Mussorgsky solo piano version. "The Great Gate of Kiev" and the "Introduction-Promenade" thematics seem more elemental and rousing. Some of the character study movements seem harder edged, thicker, more pressing in their immediacy. The performance has much to recommend it. Harth-Bedoya and the Ft. Worth musicians put their heart and soul into it. There is the kind of extra oomph one can get in a live performance and it is a very good thing. Turning to the Prokofiev and its post WWII 1945 mood alternating elation, fatefulness and really some remaining clouds of gloom, the music is as memorable as anything Prokofiev wrote. The clock-midnight theme is as evocative and Modernist as anything Prokofiev ever did. There is beauty in the bluster of some of it, a sad hopelessness in some of the romantic themes, or that is how I feel the music in this time of my life. Harth-Bedoya has wisely avoided the several suites Prokofiev put together from the original score, and instead chosen thirteen numbers from the full score. In my own personal view it is hard to top the complete ballet as done by Gennady Rozhdestvensky, USSR Radio & TV Symphony Orchestra, but then that runs several hours. For a 40-minute encapsulation this version is hard to beat. There is plenty of scampering energy to the gallops; there is passion and a feeling of potential doom to the midnight music, and there is passion to be heard in the romantic movements. I cannot imagine readers here who do not know either of these works. If there are any this is a good place to hear the works, with the proviso that "Pictures" is not in the version the world is used to hearing. Yet that should not stop you. Those who know both works intimately would benefit from this program because the Ft. Worth outfit seem filled with joy, enthusiasm and energy in their performances and the sum is different enough that you will no doubt gain something nice in the hearing. This one is a nice surprise! I recommend it.